Easily add a box behind your text layer. This free script creates a rectangular shape behind every selected text layer. You can add padding, roundness and set the box color or add a random one. These scripts are copyrighted by Motion Boutique. They are free for personal and commercial use but come “as is” with no warranty nor any free personal support. Redistribution in any form is not allowed, instead always link to www.motionboutique.com for correct files. By downloading any of these scripts, you agree the above terms. Our first product is now one year old! (warning, spoiler inside) Happy Birthday!!! Fold and unfold layer painlessly! We are happy to announce that we've updated Newton to version 2.1! 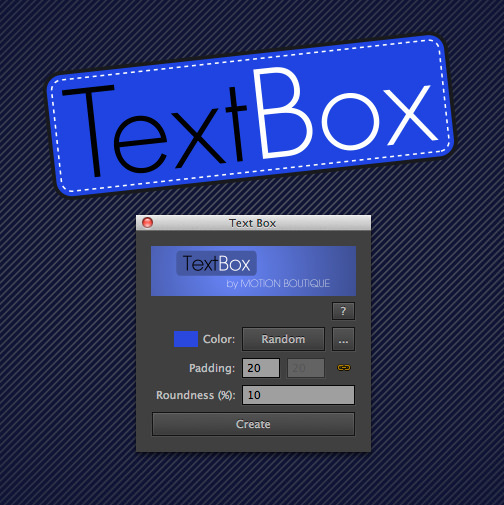 Easily add a perfect box on your text layer! Create Soft body using Newton2 and Connect Layers. Learn how to create soft body using Newton2 and Connect Layers. James Hazael created a Strandbeest (amazing kinetic sculpture by Theo Jansen) using Newton2. Transform the content of the text layers into ASCII art!! Create soft bodies that react to a predefined animation using Newton2 and Connect Layers. This After Effects script creates shape layers and distributes them around a sphere. Newton in BattleBlock Theater Cutscene. We are happy to announce that we’ve updated Newton to version 2.2! By popular demand, here’s the Pastiche Running Man project. Thanks for everything that you do for all of us filmmakers/videographers. Still can’t see how to add padding to get the space between the fill and dotted line.. ? Any solution? ?..i tried what jacob RG said..but its not workin for me! make sure you copy the (TextBox_Resources) folder as well as the jsx. Awesome!! Thanks Guys!! Love your work! I selected my text and I press on the Textbox script, its says: unable to execute script at line … .. folder or file does not exist ??? What do I wrong? I went to file in After Effects, scrolled down to scripts, click that to run a script and then select the script I wanted. It opens up. While it would not embed in After Effects, it was still usable. Hey guys – tried “run script,” and I still get the same error message – “unable to execute script at line 54. File or folder does not exist.” I’d love to use this script. Anyone know how to make this work!? I love this, but need to match the color signature for the background from a colleague… There is no eyedropper function. Any chance of an update or inclusion. Assuming you’re on mac, you can click on the “…” and use the eyedropper. I presume there’s a similar solution on win. I was actually directed to go in and use the grayscale / RGB area and put in the numbers directly. There is not an eyedropper in After Effects per se. I found the color coordinates by first applying a color overlay and then using the eye dropper in the overlay section to show me the color coordinates. Any way, I do love it. You can just create it in any color, and then change the color of the shape layer it creates. Thats the best way to match colors. Doesn’t seem to work if you use keyframes to change the text. You’re right it won’t change if you change the text. For each text you have to re-apply Textbox. I also get Unable to execute script at line 54. File and folder does not exist. Anyway to fix this? Fix it, but can’t seem to get the text box to follow the text if i use animation presets? I can’t seem to make it work on CS6, i got this error :”Unable to execute script at line 54, File or folder does not exist” Please advice ! Sorry i didn’t copy all the files ! Download link has been fixed now! Awesome, thank you! This will save me a ton of time. The fix for “unable to execute script at line 54. File or folder does not exist.” is simply to place the FULL FOLDER that opens from the zip file in the AE scripts folder, rather than just the JSX file.